Osteochondritis dissecans is a joint condition in which a piece of cartilage, along with a thin layer of the bone separates from the end of the bone because of inadequate blood supply. These fragments may be stable or unstable; if unstable, the lesion can detach and fall into the joint space causing pain and joint instability. Dr. Patel will probably order an X-ray of both the right and left knee to see the abnormality in the joint space and to compare them. 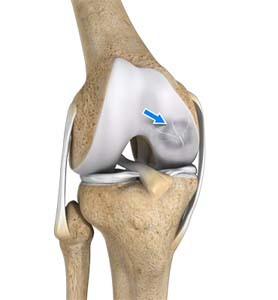 You may also have a CT or MRI scan that is useful in determining the location of loose fragments within the joint. Dr. Patel may recommend various treatments depending on the reports of diagnostic scans, age, severity, stability of the cartilage and other factors. Goals of treatment are to relieve the symptoms and stop or impede the progression of degeneration of the joint. Conservative treatment approaches such as limited weight-bearing and activity restrictions for 6-12 weeks are recommended if the condition is diagnosed at early stages and if the severity is mild. However, surgery is required if the condition is diagnosed at advanced stage or if the lesion is unstable. Open reduction internal fixation – Open surgery is performed in cases where the defected area is difficult to reach with arthroscope. Hence an open incision may be required. In this procedure an incision is made in front of the joint to allow the surgeon to see the joint and the loose bodies are removed. Internal fixation involves fixing the fragments using internal fixators such as metal or absorbable screws.